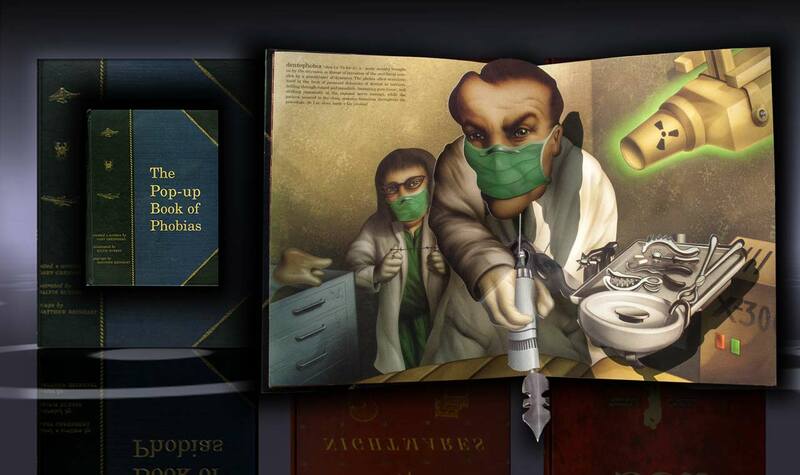 The Pop-up of Phobias was the first pop-up book that I illustrated; a great collaboration with Duncan Bock, Editor in Chief, Melcher Media. Written by Gary Greenberg, engineered by Matthew Reinhart and published by William Morrow, New York. The lowdown from Amazon: "Fear of heights, fear of spiders, fear of flying, fear of death--everyone is afraid of something. And these pop-ups place you in the hot seat--whether it's the dentist's chair as the drill comes spinning toward you; looking over the edge of a skyscraper whose sheer face plummets thousands of feet to the sidewalk far below; or the window seat of a plane as the oxygen mask deploys, your drink spills, and the horizon line shifts to an angle that is suddenly, terribly wrong….Brought to life by outrageously macabre artwork and startlingly innovative pop-ups, The Pop-up Book of Phobias is an engineering marvel and cult classic in the making--an offbeat holiday treasure sure to become this season's most talked-about gift book".